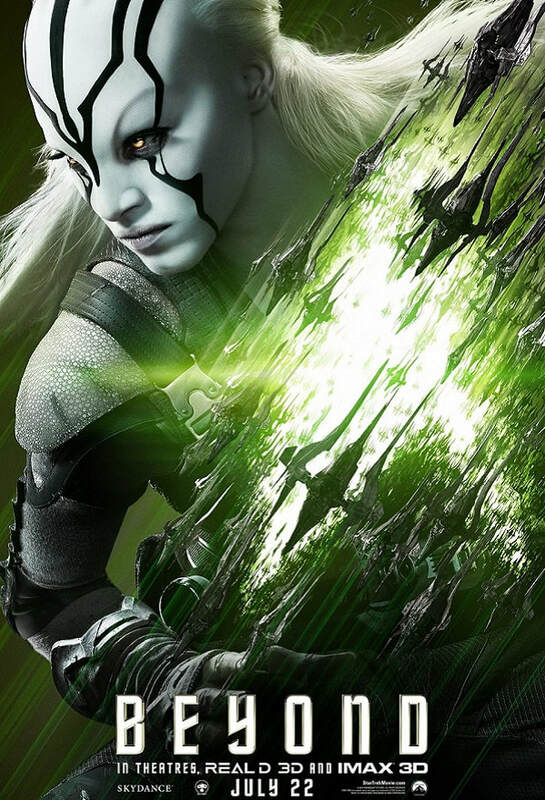 Star Trek Beyond (2016) | Movie News & Review | - Pop Movee - It's about MOVIES! McCoy: [after removing shrapnel from Spock] Yeah. They say it hurts less if it's a surprise. ​Spock: If I may adopt a parlance with which you are familiar, I can confirm your theory to be horseshit. Kirk: We make a good team. Right? Spock: I believe we do. Kirk: Space, the final frontier. Uhura: ...to boldly go where no one has gone before. 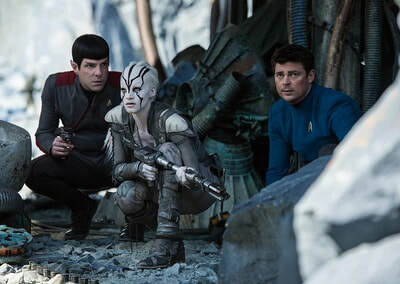 Star Trek Beyond successfully pulls off a mix of action and adventure balanced against the needs to service the franchise’s huge fan base, spanning a vast mix of gender, race and language that it has garnered over its 50 year history. 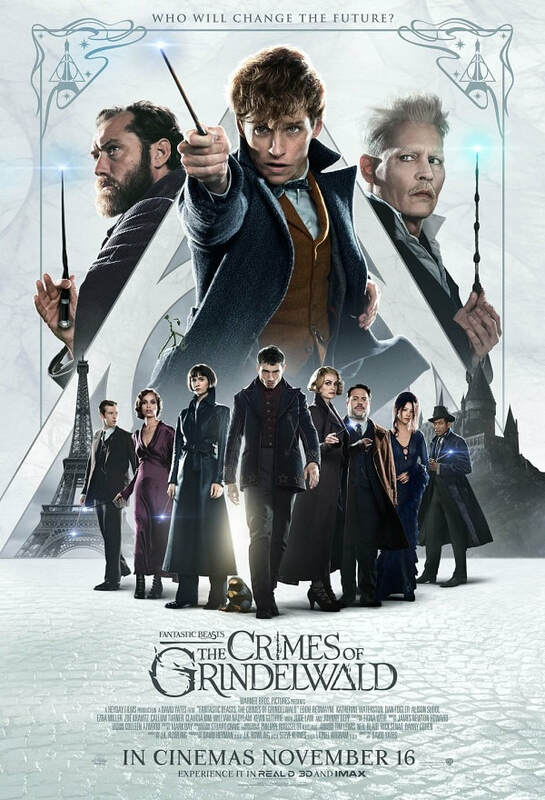 There are points in the story, written by series actor Simon Pegg & Doug Jung, where the pressure of a hasty production could have done with a little more polish. 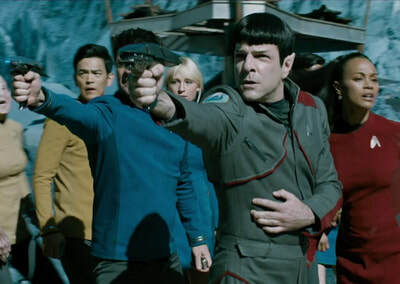 However, the addition of Justin Lin, taking over directing duties from J.J. Abrams, compensates, as his skill in the action genre, having revived the Fast & Furious franchise, sees the Star Trek movie series deliver the biggest set-pieces it has ever attempted. 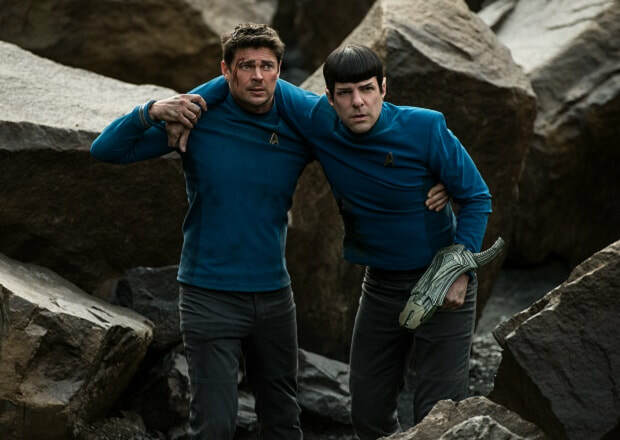 The overall result is a film that does enough to please fans without pandering and capitalizes on the the success of the last two films in the reinvention of Star Trek as popular cinema fare. Star Trek Beyond, rather wisely, picks up several years after the events of Into Darkness. The USS Enterprise is three years into her five year mission, which is a clever nod to The Original Series; having originally been cancelled after three seasons. In effect, Pegg and Jung are saying to fans, here’s what the next adventure of the Enterprise and her crew would have been (albeit set in the alternate ‘Kelvin’ timeline established by Abrams’ 2009 movie) if the show had kicked-off a fourth season. At this point in their mission, Captain James T. Kirk (Chris Pine) and his crew are well-worn by the challenges of deep space life and ship’s complement are all a little frayed around the edges. Countless ‘First Contact’ missions and the never-ending exploration of space has dimmed everyone’s enthusiasm to “Boldly go where no man has gone before”. In an attempt to boost morale, the Enterprise heads to Statbase Yorktown, a massive self-contained space facility that has been established as a galactic beach-head for the expanding United Federation of Planets (the Star Trek equivalent of the United Nations). No sooner has the Enterprise arrived at the Starbase, a new mission comes their way as an alien ship emerges from a nearby collapsed nebula; its sole occupant pleading for help to rescue her crew from an alien adversary. 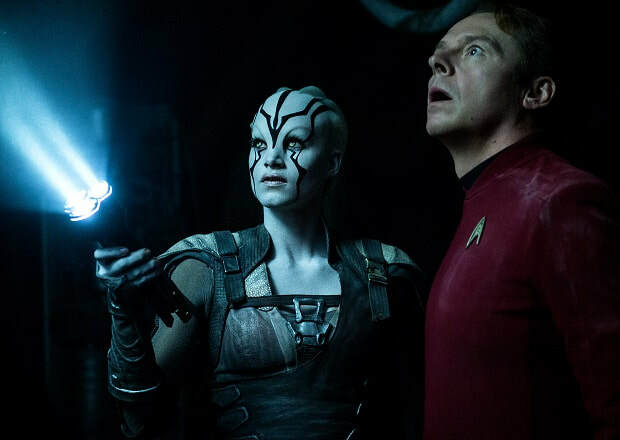 In terms of set-up, this is where Star Trek Beyond’s story lacks a certain logic. On the slimmest of evidence, the Enterprise and her crew head back out into space with an alien they don't know the slightest thing about and no support against an adversary they’ve already learned has advanced technology capable of destroying starships. 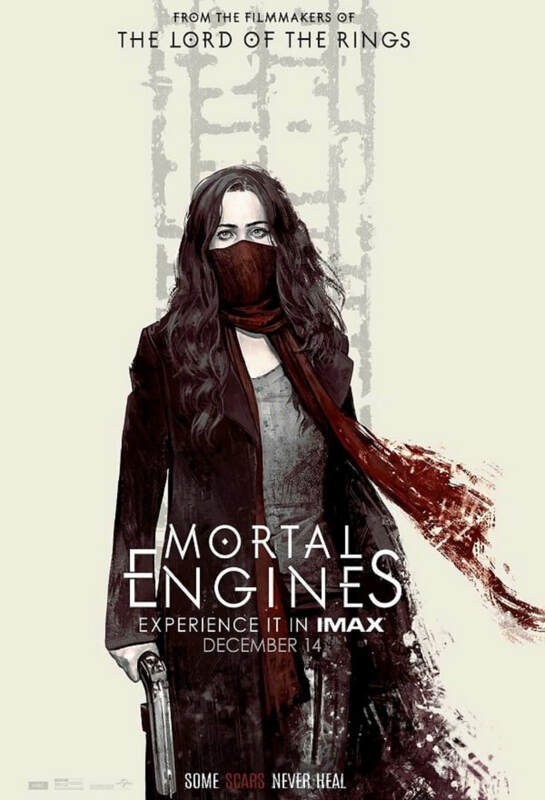 To overcome this, Justin Lin unleashes the film’s first set piece upon the audience, as the alien adversary gains a name and a face in the form of Idris Elba’s Krall. 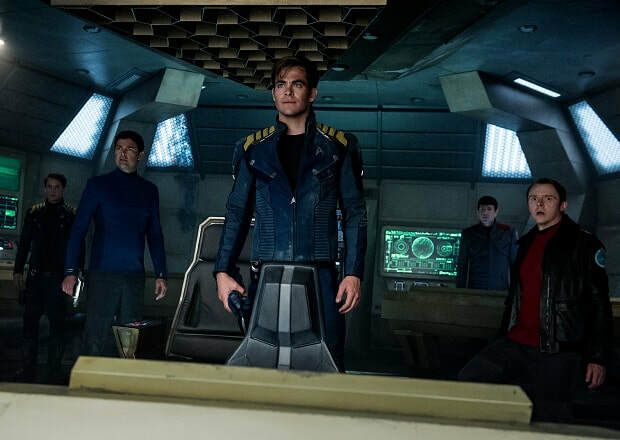 Fans of the Star Trek feature films have become used to the Enterprise being completely destroyed, but Star Trek Beyond takes it to a whole new level. 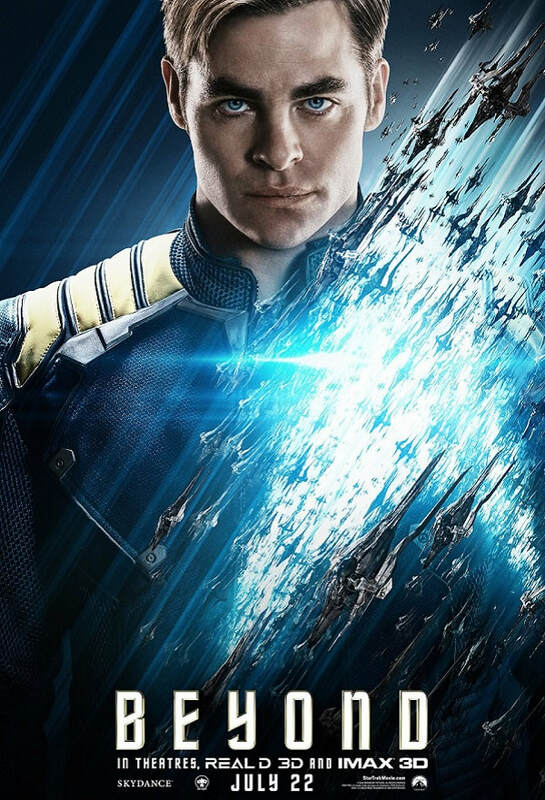 Krall’s swarm ships take the Enterprise apart piece-by-piece as Starfleet’s flagship is smashed for the seventh time out of thirteen feature films. 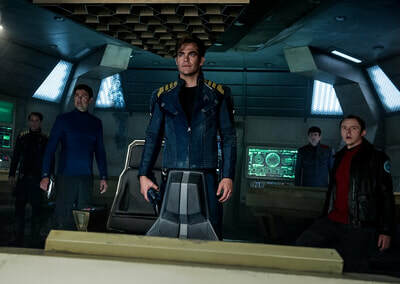 Credit goes to Pegg and Jung at this point, as the subsequent evacuation sees the crew split into smaller groups who end up having much more meaningful screen time than previous films. Kirk and Chekov (the late Anton Yelchin) work together to locate the ship’s crew, Bones (Karl Urban) has to employ a little old-school M.A.S.H style first aid to save Spock (Zachary Quinto), Uhura (Zoe Saldana) and Sulu (John Cho) attempt to uncover Krall’s plan and Scotty (Pegg) gets help from Jaylah (Sofia Boutella), an alien who was previously enslaved by Krall but has escaped and is a hiding a huge secret. 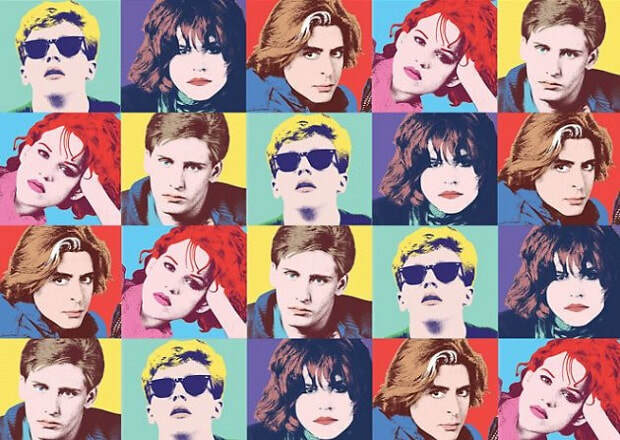 It works well and gives everyone involved a sense of purpose throughout the film’s Second Act. 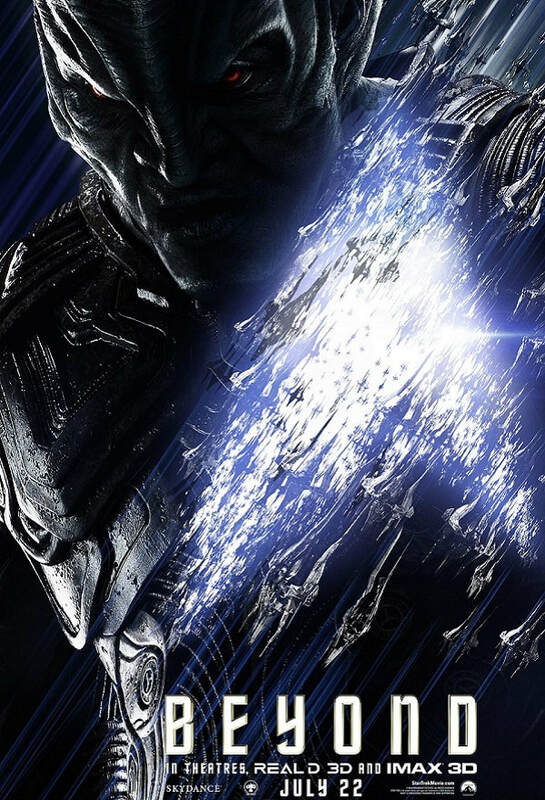 The most underwhelming character is Idris Elba’s Krall, who, for the first part of the film, seems to lack reason for his desire to destroy the Enterprise and capture her crew. 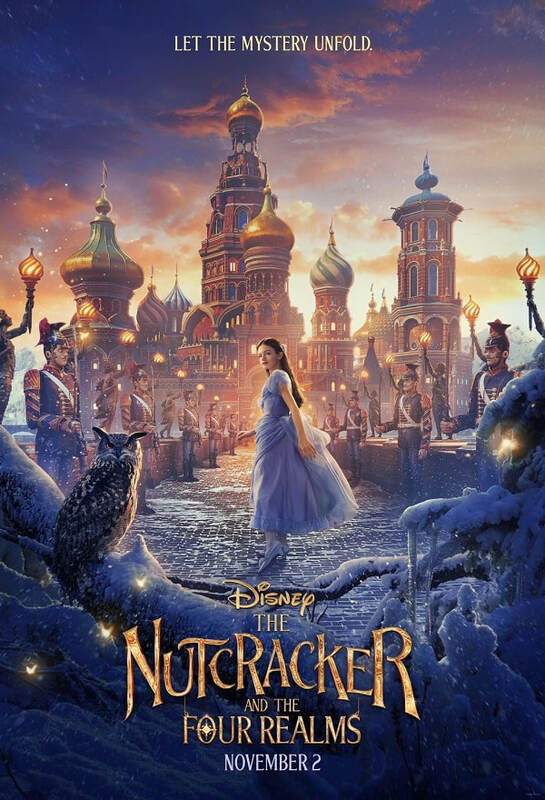 Fortunately, the character’s motivation crystallises in the film’s finale, allowing for a face-off between the thematic ideals of War and Peace! 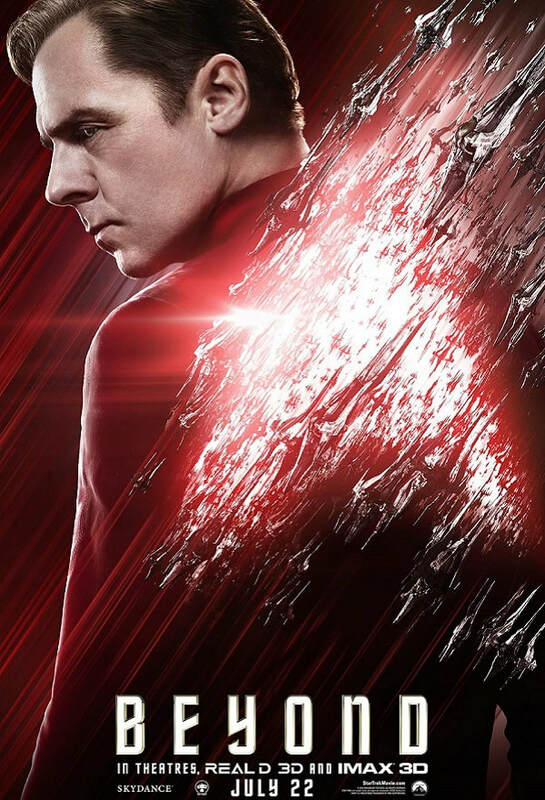 Justin Lin and his production team deliver the most visually action-packed Star Trek film ever. 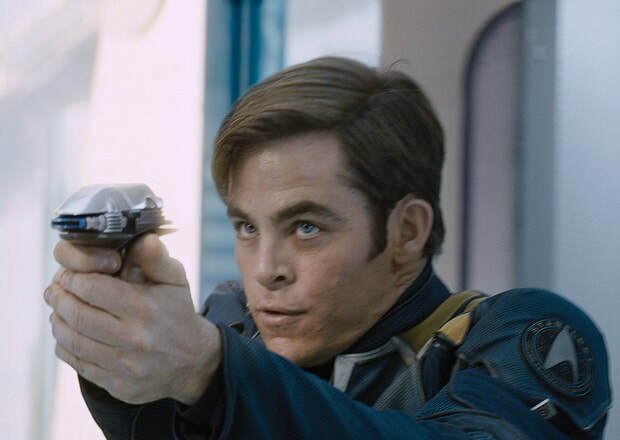 From Krall’s attack on the Enterprise in space, a massive set-piece with Kirk and Chekov being pursued by the antagonist’s underlings in the smashed saucer section of the ship that has crash-landed in the planet, to the huge visual effects-driven finale aboard Starbase Yorktown, Star Trek Beyond leaves the audience feeling like it has over-dosed on eye-candy. 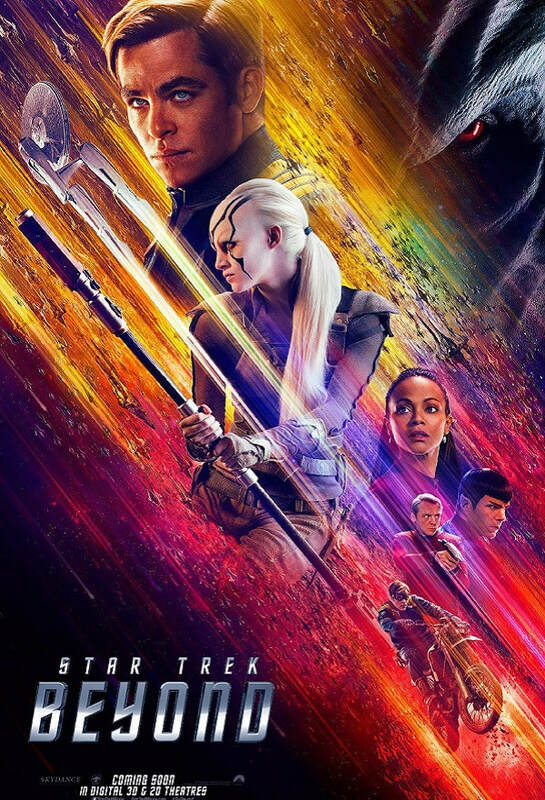 Australian cinematographer Stephen F. Windon, who has worked with Justin Lin on the last four Fast & Furious movies, gives Beyond the most vibrant look of any Star Trek feature film, choosing to accentuate colour, providing yet another homage to The Original Series that will not be lost on fans. Thomas E. Sanders production design also references the aesthetic of the show, providing a mixture of high-tech settings, such as Starbase Yorktown, and more organic environments on Krall’s alien planet. Sanders does an especially nice job of expanding the Enterprise sets from Into Darkness, allowing Lin and Windon to capture the full scope of the action when Krall and his forces board the ship about a third of the way into the film. 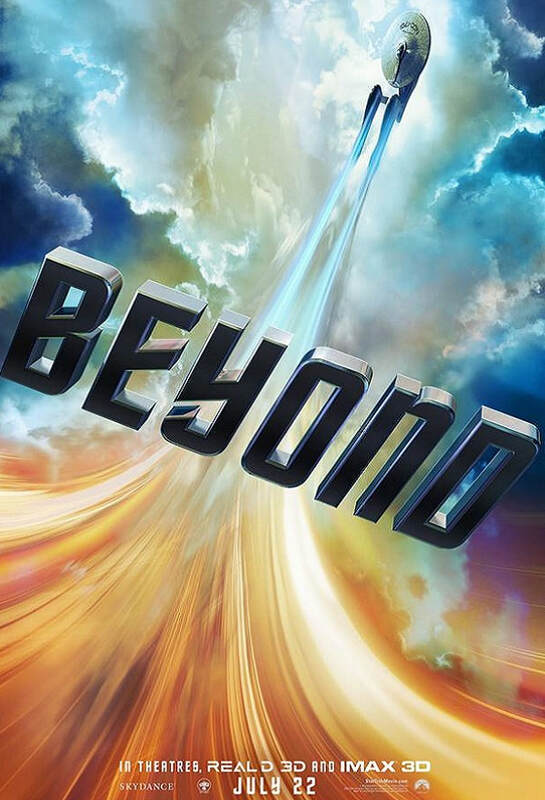 Star Trek Beyond may not the deep and meaningful meditation of the human condition that was extolled by The Original Series creator Gene Roddenberry, but there's a lot of action, a fair degree of humour and enough acknowledgement of the broader Star Trek franchise to more than satisfy the needs of the many. In early 2015, executives at Paramount Studios (the owner of Star Trek movie rights) were believed to have wanted the next instalment to be more like Guardians of the Galaxy, the Marvel Studios sci-fi action film that had hit Box Office pay-dirt the previous Northern Hemisphere summer. Understandably, fans were horrified at how a Guardians overlay would look on the Star Trek franchise. Fortunately, the creative team behind Star Trek Beyond are all experienced film-makers and have worked in big franchises previously. They’re all smart enough to know you just can't do a creative knock-off of the last best effort and hope it will succeed. (That’s for Roger Corman to take care of…) It’s fair to say there is some Guardians influence in Star Trek Beyond, but that's not a bad thing. 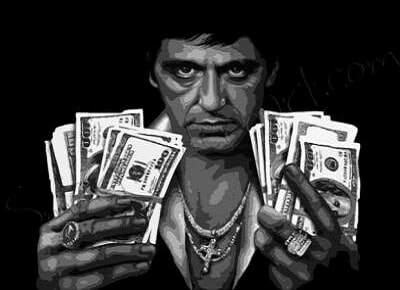 There’s also Fast & Furious influences. 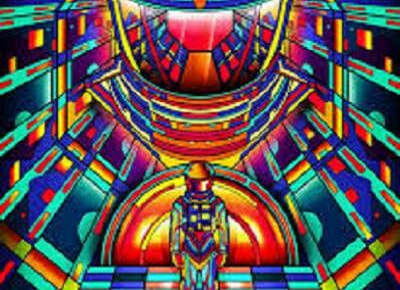 There’s Star Wars influences. 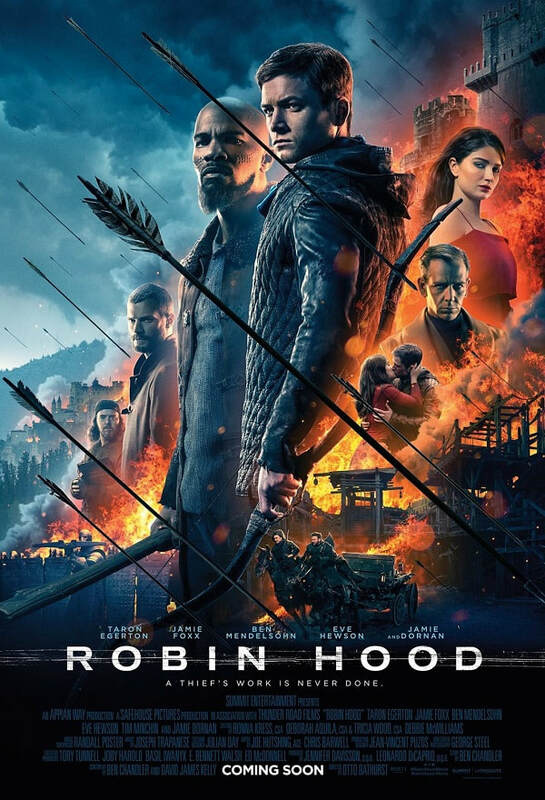 You name it, there’s another franchise in there. That’s just movie-making. 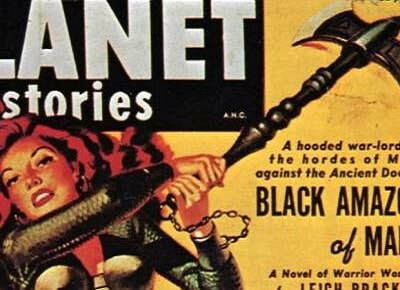 In the end though, the biggest influence is the Star Trek franchise itself. 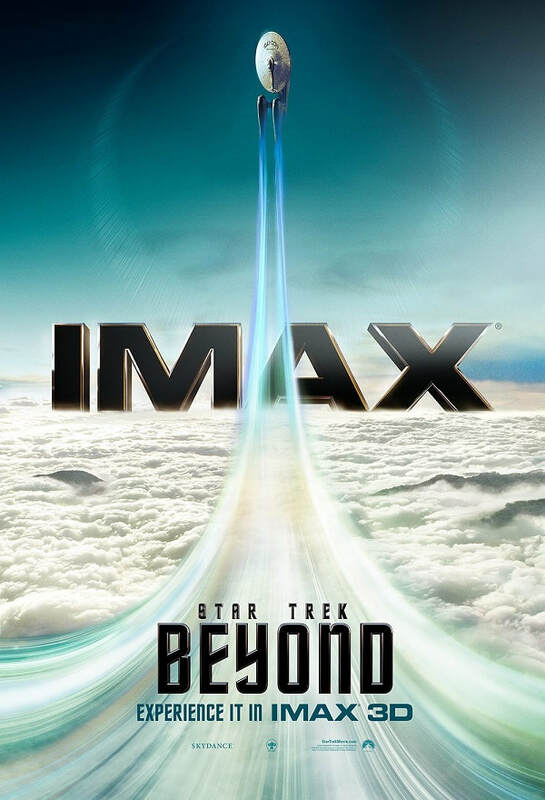 Star Trek Beyond honours the first 50 years of the franchise and helps to kick-off the second 50 years with the spirit of adventure and a nod to the franchise’s mantra of Infinite Diversity in Infinite Combinations. Live long and prosper!